The most wonderful time of the year, indeed. Last December 2, Globe Telecom held Wonderful World with Globe XII, an event that brought together the media and the telecom company’s executives and partners for a thanksgiving dinner right outside its flagship ICONIC Store at Bonifacio High Street, Taguig City. 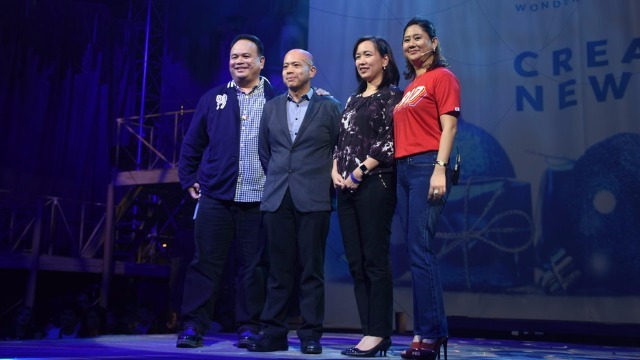 There, Globe’s top executives took to the stage and announced the newest line-up of offers and services launched using Globe technology such as SariSariPH, KonsultaMD, and HOOQ. Keeping to its theme to Create. New Traditions, the company also presented Digimall, Globe myBusiness’ biggest online bazaar which features hundreds of online shops all powered by Shopify, the world’s largest e-commerce platform. Similar to the vision behind the building of the ICONIC Store, Globe myBusiness intended Digimall to be a new way for Filipinos to shop and sell their wares. Digimall couldn’t have come at a better time. The tail end of every year, especially December, is widely considered the most important time for SMEs. Many entrepreneurs rely on the Christmas season to give their profits a final year-ender boost, and they would spend the entire year before then preparing for it. The reason behind this kind of business risk-taking is simple: at no other time of the year do consumers spend as much as they do on Christmas. The inevitable holiday shopping can generate significant sales, especially for niche and specialty businesses, easily making the considerable amount of time, money, and effort spent during the months leading up to December worth it. But despite how profitable the holidays can be for small businesses, it can also be a nightmare to prepare for: from ordering and producing stocks, to organizing logistics, to planning and executing promotional material and marketing campaigns, to a whole lot more nitty-gritty than most starting entrepreneurs anticipate. It’s no wonder then that many small businesses fall to the wayside and lose out to more established business who are ready to meet the holiday demands. Because of Digimall, SMEs now have a creative and effective way to reach their customers and take advantage of the Christmas shopping rush. Aside from the online bazaar being a one-stop-shop for building and launching online stores, with Globe myBusiness providing IT support and marketing materials such as logos and product photos, Digimall merchants are also exposed to Globe’s 40+ million subscribers, landing them in the heart of a marketplace far larger than any physical bazaar in the country. And unlike brick-and-mortar retail shops, a Digimall store operates 24/7 and caters to a worldwide audience. For those on the other side of the coin, Digimall has proven itself to be just as beneficial. Because of its set up as an online bazaar, shoppers can sidestep all the hassle and inconvenience of physical shopping—which is great news for those doing last-minute holiday shopping. Those who visit Digimall also get the chance to browse the wares and support the businesses of local entrepreneurs who otherwise have no avenues to get their products out to market. WWGXII proved that Globe is poised to keep its promise to redefine the Philippine retail experience. Globe myBusiness not only empowers Filipino entrepreneurs with the launching of Digimall, but it has also created new ways to earn and sell, as well as started new shopping practices and traditions. Set up shop with Digimall today and become part of the biggest online bazaar in the Philippines!